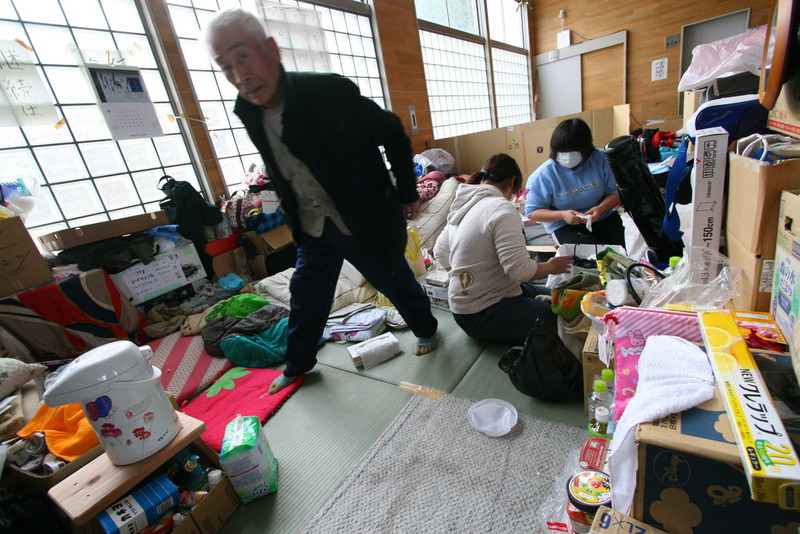 0410-Yuki Ninomiya, 83, has been staying more than 45 days and nights at a crowded shelter after a tsunami destroyed her home in Higashi-Matsushima area of northern Japan. MINAMI-SANRIKU, Japan — For more than 45 days, the Watanabe family, all eight of them, have tried to make a tiny part of a school gym floor into their home. Many U.S. soldiers, relief workers, volunteers and journalists who have seen the obliterated cities and towns of the northeastern disaster zone say privately that they are surprised at Japan’s slow pace of reconstruction. 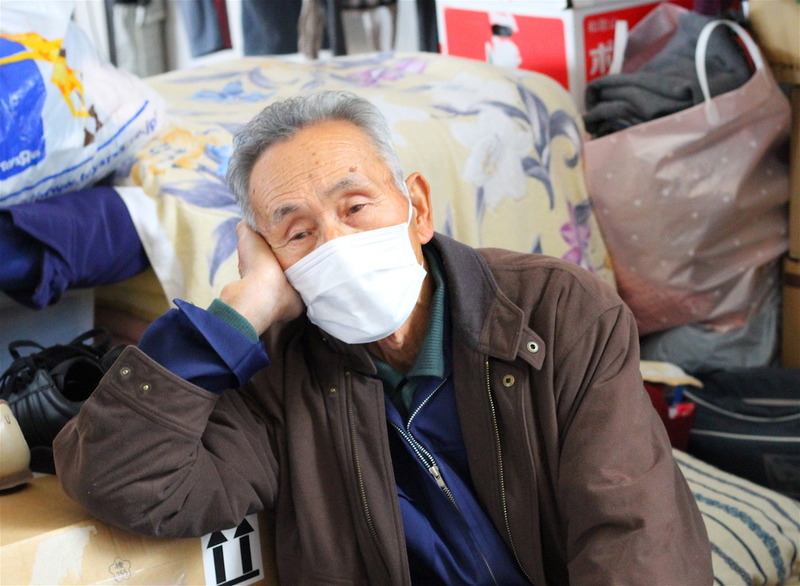 While international organizations quickly built temporary housing in Thailand and Indonesia only weeks after the 2004 tsunami, Japan is mainly trying to rebuild on its own. 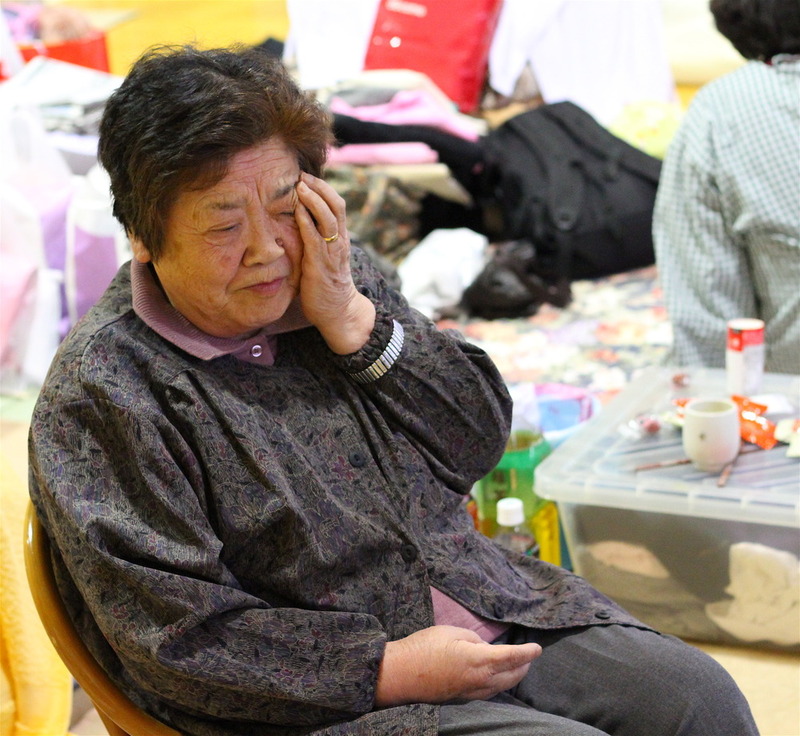 Speaking in the parliament Tuesday, Prime Minister Naoto Kan apologized for the building delays and promised to have about 100,000 temporary homes for survivors finished by mid-August. More than six weeks after the tsunami, the government has finished building only 395 temporary housing units for at least 130,000 people registered at the shelters, out of an estimated 500,000 displaced persons. Meanwhile families like the Watanabes dream of better days. Grandfather Koji Watanabe, 70, who saw his cattle swept away in the tsunami, wants some fresh air and land to grow crops to feed the hungry people around him. 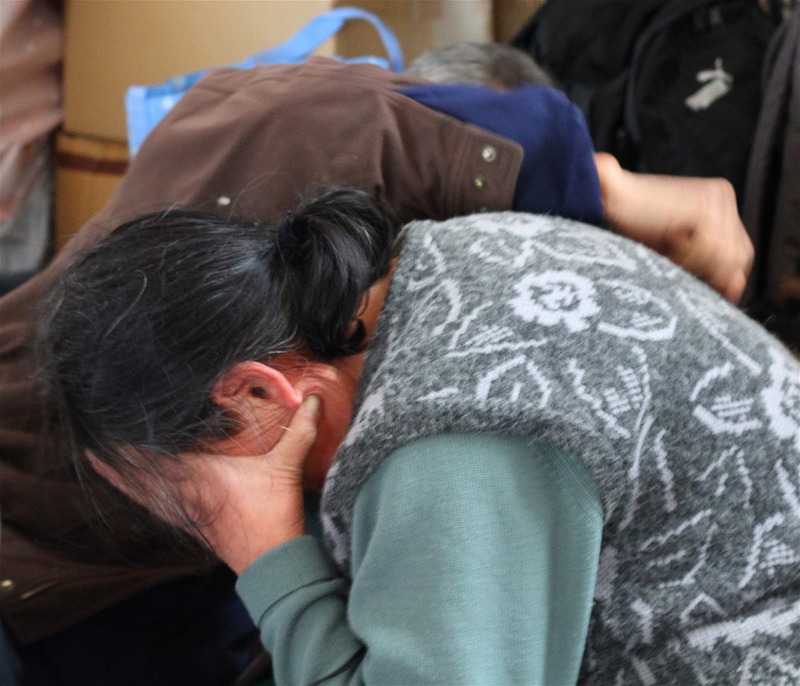 Their granddaughter, Chisato, 16, wants to play sports again, but the government needs the gyms and soccer field to house survivors. The family’s preschoolers just want to see their parents, who sleep across town in a crowded sports arena volunteering to organize supplies. In Minami-Sanriku, once a charming coastal town in northeastern Japan, construction has only just begun on 416 units for about 10,000 people whose homes were pulverized by 45-foot-high water. Authorities hope to build 3,300 units for them, but can find only seven safe building sites. Local property owners nearby have offered only 30 plots. In all of Miyagi prefecture, construction has begun on 5,370 units, according to official sources. Miyagi Gov. Yoshihiro Murai said the government might allow construction on flooded areas, if residents demand it. “Suitable locations are in short supply, so there needs to be some flexibility examining flooded land,” he told a news conference. Under the disaster relief law, provincial governments provide funding for temporary housing, while municipal governments must secure the land and manage the units. After the 1995 Kobe earthquake, authorities completed building all 48,300 units within seven months, and residents stayed for up to five years in housing built in school yards, parks, sports grounds and private land. Housing construction has been much slower this time mainly because of a lack of suitable land, said Jun Iio, a political scientist recently named to head Japan’s Reconstruction Design Council, which will oversee the rebuilding of northeastern Japan. Comparatively, within a month of the January 2010 earthquake in Haiti, survivors had constructed temporary tent cities on their own, with little help from aid groups. Hundreds of thousands of Haitians still live in those shelters, as the government has been stymied in efforts to begin rebuilding the island nation.